Way back in 2009, I was invited to my very first media dinner at Irashai Grill (now Aki Japanese). That is where I met Joyce of Vanfoodies (an under-rated blog in my opinion) for the first time. From then on, we had seen each other at various events but to never actually sit down and have a meal together. 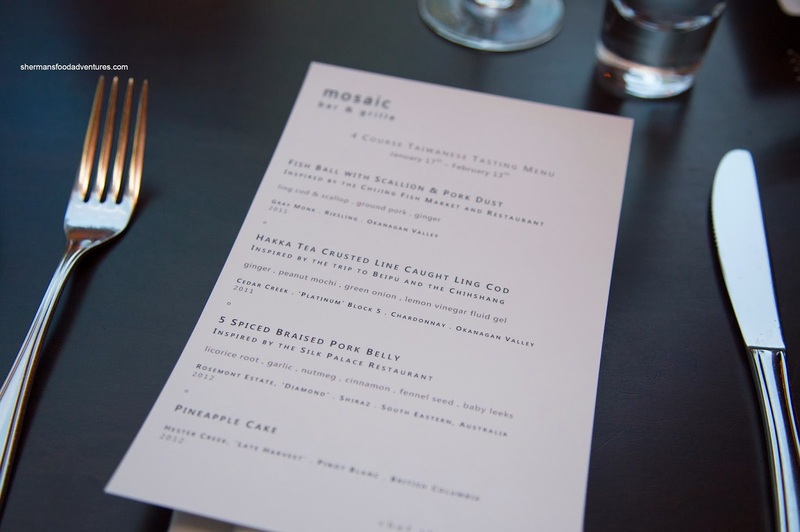 With a pending invite to try the Taiwanese tasting menu at Mosaic, the time had finally arrived. And yes, Mosaic again... Hey, it hasn't let me down before, so it was really a no-brainier. 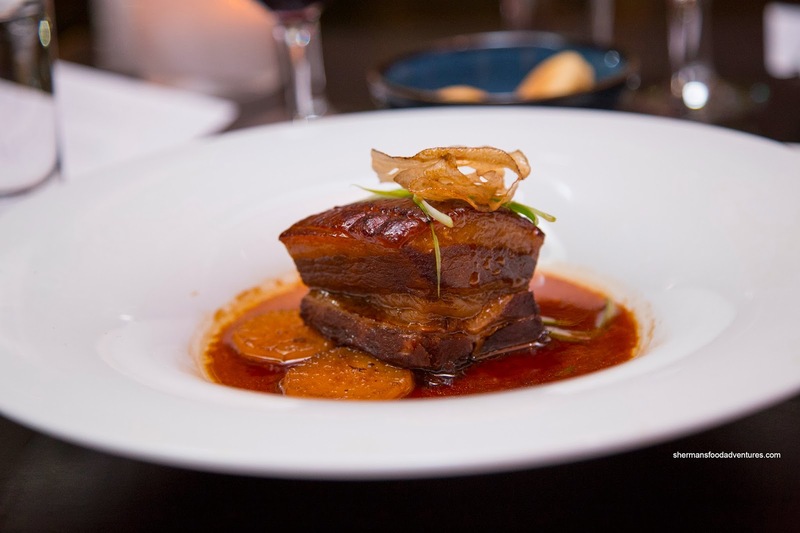 The menu was inspired by Chef Heinrich's recent visit to Taiwan. We started with the Fish Ball with Scallion & Pork Dust "Soup". This featured fish balls made of ling cod, scallop, ground pork and ginger with dried shrimp & porcini puree. I found the overly ample amount of broth to be on the saltier side with a definite ginger hit. 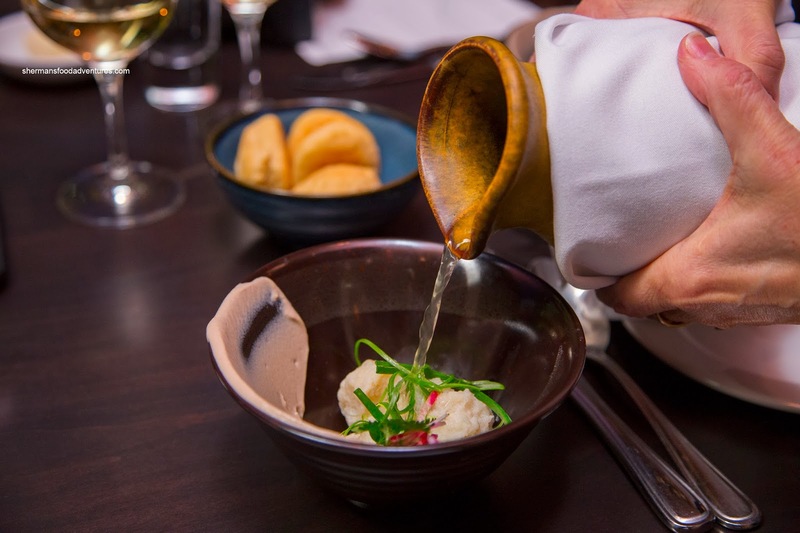 The puree smeared on one side of the bowl was aromatic and Earthy which added another layer of flavour. As for the fish balls, I found them a bit softer than I would've liked but that was a result of the chosen ingredients. I could really taste the natural sweetness as well as more hints of ginger. I thought the wine pairing of the Gray Monk Riesling as a necessity where the sweetness brought balance. 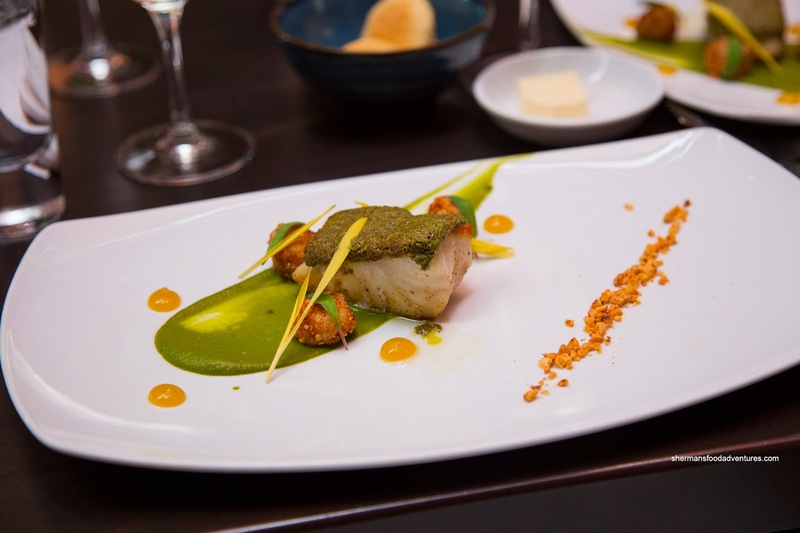 Next up was the Hakka Tea Crusted Line Caught Ling Cod with ginger peanut mochi, green onion puree and lemon vinegar fluid gel. This was an overall balanced dish that resembled Japanese more than Taiwanese. As Joyce remarked, the crust was more matcha-tasting than anything else. I found the fish to be flaky and moist with a nice crisp exterior. When combined with all of the ingredients, there was a little of everything including the necessary acidity from the gel. My favourite dish of the night had to be the 5-Spiced Braised Pork Belly with daikon, baby leeks and fried lotus root chips. I found the pork belly to be expertly prepared as the meat was moist while the fat exhibited a gelatinous texture (which was pleasant to eat). The reduced braising liquid was silky and full of flavour. Naturally, with the use of 5-spice, the licorice and cinnamon flavours really came through which was a nice compliment to the belly. 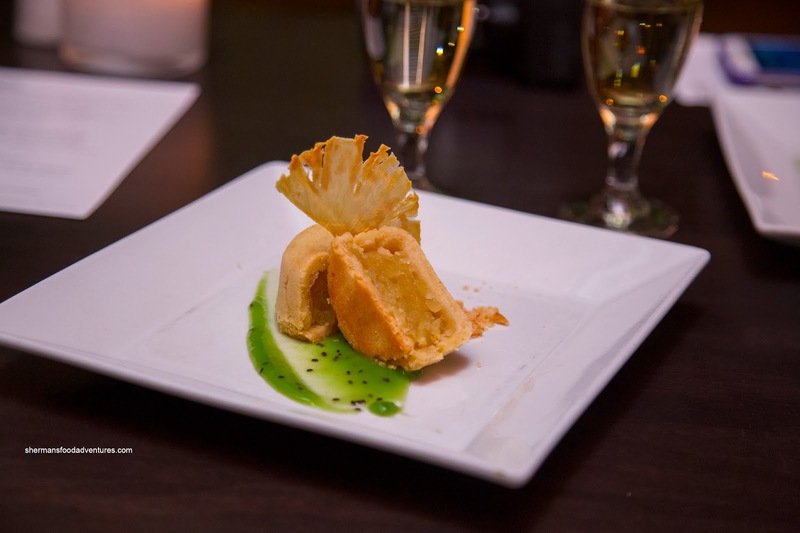 Finally, we had a Taiwanese classic being the Pineapple Cake with kiwi puree and pineapple chip. There was supposed to be a scoop of sesame ice cream, but it was served before being plated. I thought they did a good job with the cake as the exterior was crumbly and buttery. As for the inside, the pineapple was not overly sweet and had a nice candied texture. Interesting, both Joyce and I thought the kiwi puree was the beneficiary of some plum (since it was so sweet and tangy), but it was only kiwi. Overall, I thought Chef Heinrich did a pretty good job with the Taiwanese-inspired menu as 3 out of the 4 dishes were on the money.